A Goodwin College professor travelled all the way from the banks of the Connecticut River to the heart of Paris last month to present a paper at a prestigious French school on the power of Shakespeare. Randy Laist, professor of English at Goodwin College, was invited to speak at a Shakespeare conference at the Sorbonne in Paris, which houses many of France’s most influential institutions of higher learning. The conference was hosted by the École Normale Supérieure, a highly competitive private French university, from April 20 through April 27 in honor of William Shakespeare’s 450th birthday on April 26. The conference was a gathering of scholars from many of the most prestigious institutions from around the world. As part of the conference, Laist presented a paper on the power of Shakespeare’s words and the power of language to shape the world. For Goodwin College students looking to future careers, Laist said he believes that the words of Shakespeare have an even more profound impact now than they ever have in the past. While speaking at the conference, a professor who teaches at the Sorbonne asked the Goodwin professor to come and present to his class on U.S. television. Laist was the editor of Looking for LOST, a series of critical essays on the hit television show. The presentation to the French university was so successful, Laist was asked to return to France in July for another presentation. The trip is being funded by the French institution. 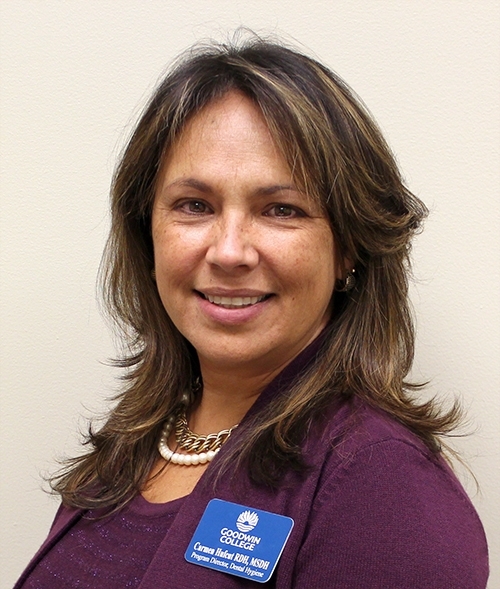 Goodwin College is pleased to announce that Carmen Hufcut has been named Goodwin College’s Program Director of Dental Hygiene. Hufcut, who was born and raised in Puerto Rico and currently resides in Milford, came to the United States in 1986 to pursue a Dental Hygiene career at the University of Bridgeport in Connecticut. “I learned English as I went through the program,” Hufcut said. This feat was not an easy one, but she was determined to pursue an education, as are many of our students, and she became the first member in her family to earn a college degree. Hufcut received an associate’s degree in Dental Hygiene and went on to receive a bachelor’s in Health Science and a master’s in Dental Hygiene with a concentration in Education and Public Health. Hufcut previously worked as a full-time dental hygienist for 16 years. After getting married and having children, she worked part-time for four years and opened a placement agency for dental hygienists, assistants, and dentists. As a dental hygiene faculty member at the Fones School of Dental Hygiene School at the University of Bridgeport, her alma mater, she secured a $50,000 grant from the state to develop a school-based dental sealing program. As a result of this grant, a dental hygiene clinic was opened in one of the elementary schools in Bridgeport. In 2011, Goodwin College was looking for a consultant for its upcoming Dental Hygiene Program, and Hufcut fit the criteria perfectly. She quickly assessed the overall needs and began the process of developing a new program. “I researched and incorporated current trends and standards into the dental hygiene curriculum,” Hufcut said. In 2012, Hufcut was hired as an Associate Professor, leading the Dental Hygiene Program as the Program Director, responsible for its overall development and academic integrity. Hufcut brought the expertise and specified skill set needed to make Goodwin’s Dental Hygiene Program successful. Scheduled to open in May 2014 pending accreditation, the program has exceeded expectations in accordance with the Commission on Dental Accreditation (CODA). “It took a year and a half to come to fruition. This specific program has been developed differently from other programs, integrating clinical/classroom-based learning and eLearning,” Hufcut noted. Goodwin’s program is the first to offer hybrid core courses – a combination of online and in-class sessions – to enrolled students. Students will be using the latest state-of-the-art equipment. Two patient simulators have been purchased to make the learning experience as hands-on as possible. The program will be taught in six consecutive semesters, spreading out the curriculum, and making it more manageable. “Goodwin’s vision is different. The majority of our students have to support families. They need to work, but at the same time they want to succeed in life. The program’s structure will be more conducive to their lifestyles,” Hufcut said. Dental Hygiene is a promising field to enter into. “In this field, you have freedom of choice. You could work full-time or part-time, and you can choose the type of environment you’d like to work in. Registered hygienists could provide dental hygiene services for patients in hospitals, nursing homes, and public health clinics. You could teach hygiene students in dental schools and dental hygiene programs, as well as, research, office management, and business administration,” Hufcut said. Dental hygienists can earn an impressive hourly rate after just two years of schooling. As the opening date approaches, Goodwin is busily readying faculty and staff to launch a successful program that will help many students reach their goals. “We are really excited. The clinic is beautiful, and there is great access to the community. With the right faculty we will exceed expectations,” Hufcut said.